The Spurs remain winless in the Rodeo Road Trip and have now lost four in a row for the first time this season. On its own, the Spurs 125-105 loss the the Jazz is not all that worrisome. Utah has a good team that is solid at home. No Derrick White or Rudy Gay meant San Antonio was going to have to resort to unfamiliar lineups and would lack firepower. The result was predictable, if we are being honest, and the way the game played out was far from disastrous. It’s the context in which the loss came that makes it feel weighty. The Spurs have now loss their last four, all on the road, and still have four more matchups away from the AT&T Center before finishing the Rodeo Road Trip. If they can’t figure out a way to win outside of San Antonio, the cushion they worked so hard to build will disappear. This game did nothing to suggest a turnaround is coming, which is why it feels significant. To be fair, the coaching staff did show the urgency and inventiveness needed to try to contain a good opponent while shorthanded. The Spurs came out of the gate prepared to mix things up on defense. 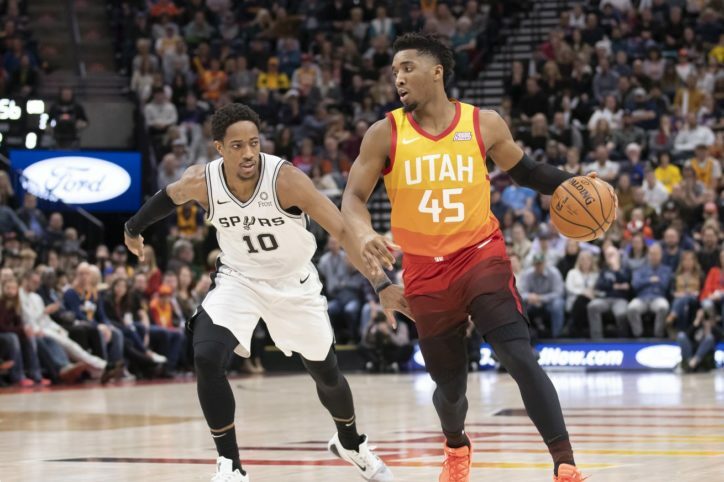 At different times they played a triangle and two zone that successfully disrupted the Jazz’s flow, while also throwing in some man defense in which they simply ignored some of Utah’s questionable shooters to pack the paint. It worked for the better part of the first half, before Ricky Rubio and Joe Ingles started to figure out how to counter it. Unfortunately once that happened, the Spurs’ defense crumbled, as the Jazz’s ball handlers got to the paint and shredded San Antonio in the pick and roll and with kickouts. Despite their gambit not working, the Spurs were only down 14 at the half, the type of deficit that a team with an explosive offense can overcome. Without Gay to power it like he did against the Trail Blazers, however, the timely run they needed never came. LaMarcus Aldridge and DeMar DeRozan just couldn’t find that extra gear against a solid Jazz defense that took away easy points and owned the paint without neglecting the three-point line. Fortunately the Spurs could be disruptive enough on their own end to create some turnovers against an offense that couldn’t deliver the killer blow until the final period. The 11-point lead the Jazz carried into the fourth seemed surmountable if only the defense could hold while someone caught fire. Alas, the comeback didn’t happen. The Spurs couldn’t get it back to single digits at the start of the fourth, when they had the chance. After that Utah simply continued to pick apart the defense when it made mistakes while cutting down on their own errors. They ended up cruising to victory despite letting San Antonio stick around for longer than they should have. Again, the game on its own went as it was supposed to go. Without their defensive and offensive catalysts, Derrick White and Rudy Gay, the Spurs found themselves resorting to gimmicks to get stops and struggling to score against an opponent that takes pride in their ability to keep teams in check. Had San Antonio been at full strength things could have been different. This result is nothing to worry about. This stretch of the season, however, is another story. The Spurs can’t afford to keep losing, whether they are shorthanded or not. Not this year, not in this conference. Fortunately, they should be back at full health soon and have showed character in the face of adversity before. It’s time to do it again to prevent this rough spell from becoming a collapse. The Spurs need more from DeMar DeRozan, which seems like an unfair thing to say after a solid 23-point, five-assist game. But he keeps turning the ball over too much and very rarely taking over even for stretches of games, to power runs. We need early season DeMar back. LaMarcus Aldridge just had a bad game. He struggled against Utah’s bigs on both ends. Rudy Gobert, likely motivated by his All-Star snub, simply outplayed him. It happens. He at least showed some fight under the rim by going after offensive boards, which is always good to see when his shot is off. Jakob Poeltl started next to Aldridge and Davis Bertans, which was a curious decision. Facing an opponent that plays two bigs seemed like an opportunity to start Pau Gasol and add some offense to the starting lineup. I can’t complain too much, since Jakob had a good game and I’ve been advocating for a smaller role for Pau, but I was a little surprised by it. Bryn Forbes had a stretch in which he kept the Spurs in it with his shooting, but overall didn’t make a huge impact. That’s a problem when Marco Belinelli also struggles, like he did on Saturday. Patty Mills had the best night out of all the designated shooters, finishing with a tidy 14 points and four assists. The Spurs needed more than tidy, though. They needed one of these guys to go crazy, but the Jazz’s defense kept them in check. The Jazz attacked Davis Bertans, playing small forward, to start the game, getting the best of him a couple of times. Davis then adjusted and played decent defense going forward. I like him better at power forward, where his shooting brings more value, but this year he’s showed he can slide down a spot in case of emergency. Good to know. I was expecting to see Quincy Pondexter get some playing time, since the Spurs were missing two perimeter-oriented guys. Instead Pop went big, giving minutes to Dante Cunningham and Pau. I know he’s the 15th man, but is Q-Pon so bad that he can’t get on the floor even in an emergency situation? If the answer is yes, maybe the Spurs need to take a look at who’s out there in the buyout market. Ricky Rubio will become a free agent next season and I’m tempted to say the Spurs should sign him solely to stop him from torching them. His 16-6-6 stat line doesn’t reflect how he took over in the second quarter, changing the game. That guy loves to play the Spurs. This is one of two supremely winnable games in the RRT, with the other coming against the Knicks in late February. It’s the perfect opportunity for the Spurs to snap this losing streak and head over the All-Star break with a win.